The apples are pressed right at harvest to get the freshest cider. We never, ever use concentrate. The sugar is added to assure a constant amount of alcohol (8%). The yeast ferment the sugar and add their own subtle characteristics. We never, ever force-carbonate (like soda-pop). No other ingredients are necessary to make this fine cider. Harvested apples are brought to the mill where they are sorted, washed, and pressed. The fresh cider is pumped into fermentation tanks in the tank room. There, sugar and yeast are added to get the proper flavor and alcohol. Each harvest is different from the last. Year to year, the most variable quality is the sugar content of the apple. If the year was dry and hot, the sugar content will be high, but the volume of cider in the apple will be low. In a wet year, there will be more cider, but less sugar. I believe that gentle, slow fermentation preserves the bouquet and taste of a great cider. The cider ferments at low temperatures for up to five months. During that time, the fermentation is monitored, and the cider is accordingly racked. Fermentation is halted just before the cider reaches complete dryness (when the yeast has turned all the sugar to alcohol), and it’s time to bottle. The cider will continue to improve throughout a year or two, but should really be drunk within three years (or, drink it tonight!). New England Dry: is made exclusively with apples from the orchard. 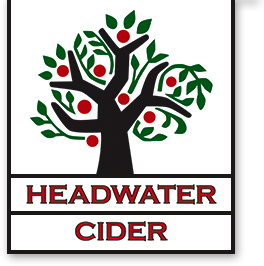 Cortland, Macintosh and Empire apples (the “New England Three”) make up the blend for this cider. The Macintosh imparts bouquet and a quick start, the Cortland adds body, and the Empire brings a crisp finish. Ashton Blend is dry (less than 1% residual sugar). The tannins from the bitters (especially the Ashton Bitter) smooth the acid from the Macintosh without reducing the nose. Like New England Dry, Ashton Blend is fermented to 8%.